Isabelle has opinions. Loud ones. She can only express them in one way, so that’s why after the 6pm feeding, we spend a lot of time soothing, bouncing, and snuggling, often time with no break in the tears. The time before “bedtime” is very hard for them. They’re still fed every three hours, but 9pm is when they go in their cribs until the 6 am feed. We do all feedings at night in their rooms and keep it dark with a sound machine – all in a continual fight to establish a good sleep routine. It’s been a particularly challenging week with her, but through the tears (for both of us), I remembered that last year at this time, I thought this would never happen. And really, what did I expect!? Her mama has BIG emotions so it only makes sense that she would, too. So, we’re here, in a new challenge, but one that includes two precious miracles. Doesn’t make it easier, but makes the tears turn from sad to happy! 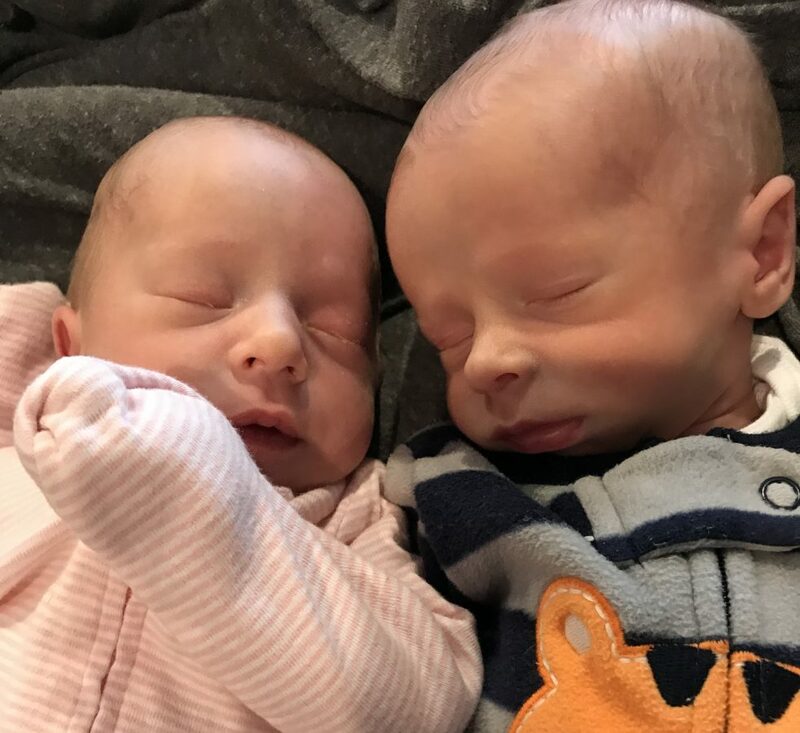 We have what will hopefully be our final weight checks tomorrow before our babes go on the “normal” schedule (making their next appointment at 2 months for shots!) We have Carter’s additional blood test tomorrow, as well. I think Isabelle will be almost 9 lbs (previous weight of 7.2 two weeks ago) and Carter will be just over 7 (previous weight of 5.13 or 14 two weeks ago). I’m thankful they like their carrier because there is nothing like being unable to soothe 2 babies! We hang out in it a lot. It’s the only way I can actually hold both effectively. Previous Post What no one tells you (and it’s all going to be okay). Love the pictures of all of you. Can’t wait for my next snuggles. Love you guys!